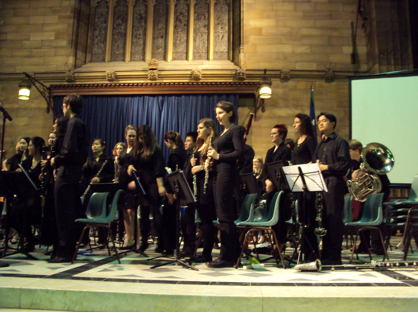 The Sydney University Wind Orchestra exhilarated a crowded Great Hall audience on Saturday night 28th May 2011 with a superb performance of a varied and demanding repertoire of both traditional and modern pieces executed with magnificent precision and expression that was most professional under the baton of talented and energetic conductor, Adrian Tan. Enthusiastic listeners who enjoyed the rich diversity of the program, which was titled Godzilla Eats Las Vegas after the final data-projected razzmatazz tour de force piece of that name, included an understandably very proud group of family and friends of the performers. All enjoyed the intriguing blend of subtle melody, surprising percussion and gloriously inspirational crescendo that resonated beautifully in the delightful acoustics of the cathedral like hall. Even the solemn portraits of former vice chancellors peering down on either side seemed to relax into a happy smile of joyous approval at the toe tapping cheerfulness and transcendent virtuosity of the evening that was translated to them with crystal clarity. 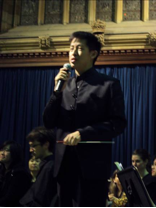 The Sydney University Wind Orchestra stands to honour their conductor, Adrian Tan. Conductor Adrian Tan, also with family members present who had flown in from Singapore for the occasion, quickly established a humorous rapport with the audience, giving valuable insight to the pieces and stimulating engagement of the mind, imagination and also physically with some clapping in time that was invited at appropriate moments. Unusual features of the night included percussion foot stamping and voice sound effects by the performers as they played, as well as some singing and then party hats and crackers at the end when the monster Godzilla was defeated. An undoubted highlight of the evening was the skilful, versatile and evocative performance of flautist Alexa Still, formerly principal flute player of the New Zealand Symphony Orchestra for eleven years and now head of flute at the Sydney Conservatorium of Music. Her accomplished multi-octave rendition in the Gemeinhardt Suite, defined once more how this oldest of treble instruments, played with great skill, can draw us deftly into a dazzling dance of the imagination through a delightful landscape of myriad melody tracks that is illuminated with glorious sunshine as the rest of the orchestra explore them in splendid romp. After being appropriately farewelled with a gift, Alexa later returned with a just so perfect willowy dancing encore entrance, all the while playing engrossing variations of the compelling composition Can’t Take My Eyes Off You. The whole orchestra combined really well with Alexa on this beautiful piece. Another highlight was the complex set of poignant moods established by the fifteen minute medley of inviting melodies from Andrew Lloyd Webber’s Phantom of the Opera. This was arranged most tastefully by Johan De Meij and played with such a breathtaking combination of all the resources of the wind orchestra, that it commanded rapt attention and thoroughly deserved the tumultuous applause it received. Adrian Tan, in discussion with grateful members of the audience post-performance, revealed that he had wanted a program that extended every performer and made each work very hard. This happened flawlessly and was achieved without apparent strain. The enormous restraint and discipline that engineered it, however, was as obvious as its product – a magnificent tone and satisfyingly precise timing. If the walls of the grand old Great Hall could have spoken, they surely would have agreed that this wind orchestra has produced one Godzilla of a performance, the memory of which will cheer us through many a winter night until we are drawn back irresistibly the next time when these talented musicians storm the stage.